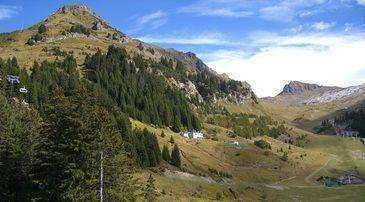 Surrounded by vast stretches of pine forests and green mountain pastures, La Féclaz is an idyllic alpine resort which is a far cry from the larger, busier resorts in the region. La Féclaz is connected to one of France's biggest ski areas; Savoie Grand Revard. This close proximity makes La Féclaz suitable for keen skiers, and also means that during the summer the resort has excellent connections via lifts and public transport to some of the most scenic spots in the French Alps. 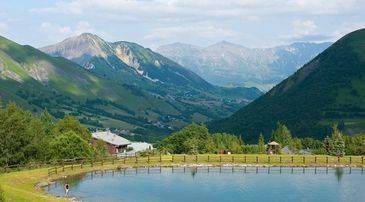 The resort itself is situated in the heart of the Bauges mountain range in the French Prealps, which can be found in the east of the country. The historic Savoyard city of Chambery and the popular spa town of Aix les Bains can also both be found just 20 kilometres from La Feclaz. La Feclaz itself is picture perfect and peaceful with first rate facilities. The rustic residences on offer fit perfectly into the stunning Alps scenery, none more so than Madame Vacances' chalet property, Les Chalets du Berger. There is no shortage of outdoor activities to try in La Féclaz. Take in the breath-taking rural views with a relaxing amble along one of the many Nordic walking paths of the resort. These hiking trails range from gentle strolls suitable for children to challenging uphill routes which can take a whole day to complete. Other ways to enjoy the sunshine and scenic sights include horse riding through the rugged landscape or getting involved with France's favourite national pastime; cycling. 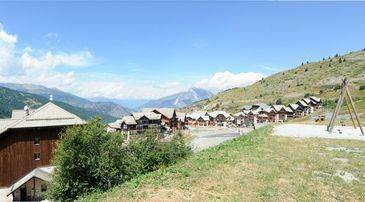 There are miles of cycling paths in and around La Feclaz, as well as ski lifts suitable for transporting mountain bikes. There are plenty of golf courses close to La Feclaz, including the 18-hole Golf Aix Les Bains, which is situated just six kilometres from the resort centre. Paintball and tennis are also popular in La Feclaz, as well as a whole host of indoor sports such as basketball, volleyball, squash, and badminton. The panoramic views of La Feclaz are unbeatable and best enjoyed from above. If you would like to brave the dizzying heights of this mountainous region then try soaking up the stunning sights on a panorama flight, or even paragliding. These aren't the only exhilarating outdoor sports to try during your summer holiday to La Feclaz. Bungee jumping and summer tobogganing are also guaranteed to get adrenaline flowing. If you would prefer to steer clear of the great heights that La Feclaz boasts then get down beneath the ground and discover the caves of the resort with a guided cave exploration excursion. Water sports are a great way to cool off during the summer and rafting down the white water rapids always proves popular with adventurous holidaymakers to the resort. Two very modern activities well worth trying out are canyoning and hydro speeding, which involves clinging on for dear life as a huge inflatable float leads you down flowing rivers and streams. There are also plenty of relaxing and leisurely ways to take to the water in La Feclaz, such as fly fishing for rainbow trout in the Isere River or sailing on the Annecy Lake. La Féclaz has a wide range of restaurants on offer so every visitor to the resort can find something to suit them. From high altitude mountain restaurants serving authentic local cuisine to affordable, family favourites where children can enjoy a slice of pizza or a bowl of pasta, you will find every type of eatery on offer. One of the most popular places to eat is Le Chalet de Loup. This rustic restaurant is set in the heart of an alpine forest close to Les Chalet du Berger. If you're searching for an authentic Alps dining experience then Le Chalet du Loup is an ideal choice. Regional delicacies can also be enjoyed in the traditional wood and stone interior of The Range. Pizzeria La Caribou is situated next to the station in the centre of La Féclaz and specialises in pizza and decadent, sweet treats like chocolate fondue. As it is such a cosy and quiet destination, La Feclaz is not the number one choice for party holidays. There are, however, enough bars and pubs in the resort to ensure that guests can socialise with locals and fellow tourists, and enjoy some of the friendly hospitality that the region is famous for. L'Abreuvoir is a popular pub which is an après ski favourite through the winter and a social gathering hotspot during the summer season. This pub regularly hosts themed parties and has a welcoming international crowd. Another option is the low key dance club, Le Sapey. Alternatively, guests can make full use of the shuttle buses, lifts, and public transport options which provide easy access to neighbouring towns which boast busier nightlife venues. 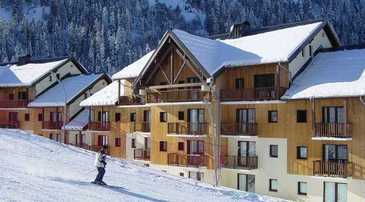 La Féclaz has lift connections to much larger resorts such as the Savoie Grand Revard. 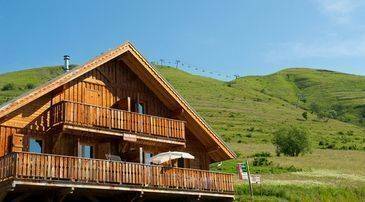 The resort has access to more than 50 kilometres of ski lift, and the main ski lift of La Féclaz, The Tesson, was replaced in 2014 to guarantee maximum comfort and easy access for its users. This lift, and many others in the resort, remains open during the summer. Parents can feel confident to go and enjoy activities and nightlife in La Féclaz while leaving their children in the capable care of fully trained professionals. Private nanny services can be arranged with English speaking au pair companies such as Snow Bugs, t4 Nannies and Safe Hands France. During the summer it is possible to park on the streets of the resort and you will find plenty of available parking spaces. Maps can be picked up from the tourist office, displaying free parking spots, which are clearly marked with the letter 'P'. In addition to this, there are street signs which indicate free parking spaces on the street, most of which are short stay spots. Within easy reach of hiking routes, in the center of the ski station You can enjoy an indoor pool, sauna, free wifi access, pool table and table football.